Issue #186 • December 2, 2013•Buy Now! This morning, as my gaze roamed over the assemblage of eye patches, graying temples, prosthetic limbs, and straining waistbands that filled the Central Control Room, I thought of you. Mowing the lawn, driving the station wagon, seated at the head of the dining table. Not that you’re anything like them, the members of our Organization, those aging international outlaws who stood around sipping the coffee and nibbling the pastries I’d had flown in from the Professor’s favorite Viennese bakery. To the best of my recollection, you never cared for sweets, an attitude you share with Rags Randall, our team’s computer and communications expert. Although none of us knows his exact age, it’s obvious that Rags is still a child, and when the Professor initially approached me about bringing him into the Organization, I was resistant. Children make me nervous. But the Professor insisted, and although I’d already seen evidence that my mentor’s mind was fraying, I obeyed. As I’ve always obeyed. Jen Fawkes’s work has appeared in The Iowa Review, Michigan Quarterly Review, Shenandoah, The Massachusetts Review, Mid-American Review, Barrelhouse, and other journals. She won the 2013 Salamander Fiction Contest and the 2013 Washington Square Award in Flash Fiction. A doctoral candidate at the University of Cincinnati, she holds an MFA from Hollins University and a BA from Columbia University. Who is your favorite Bond villain? Whenever I ask this question, people have their answer ready, as if they have been considering it for years. Some pick the classics from Ian Fleming’s universe, such as Goldfinger (“No Mr. Bond, I expect you to die!”), Jaws (mouth of metal) or Oddjob (deadly bowler hat). Some are fans of Mr. Big (“Names are for tombstones, baby!”), Rosa Klebb (killer shoes) or Ernst Stavro Blofeld (stroker of the white cat—later sent up by Mike Meyers as Dr. Evil). In many ways, these “bad guys” are more memorable than the men who have stepped in and out of the role of the hero. But what would happen if “real life” entered into this fictional world of dastardly plans? What if, for example, Dr. Evil got Alzheimer’s? 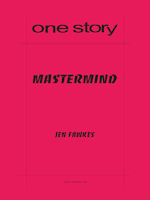 That is the question Jen Fawkes asks in her highly imaginative, satirical and moving story, “Mastermind.” Set in a volcano—a VOLCANO, people!—our new issue is narrated by Carl, the right-hand man and care-giver of an evil menace who is slowly losing his mind. Be sure to read our Q&A with Jen Fawkes to find out more about the inspiration behind this gripping story of fathers, sons, memory and heart-break. And now, back to the volcano! Will Carl be able to keep his boss’s illness hidden from the rest of their evil organization? Or at least hidden long enough to blow up Mt. Rushmore? You’ll have to read “Mastermind” to find out. JF: I was watching The Year Without a Santa Claus, and as the Heat Miser’s volcano came into view, I was seized by the story’s basic premise. I’d already been thinking about a criminal mastermind with Alzheimer’s, but it wasn’t until that moment that I yoked this notion to the James Bond–y convention of the criminal organization housed inside a volcano. I thought of Chekhov’s gun, substituted the word “volcano” for the word “gun,” and was off. JF: Giving enough emotional resonance to Carl’s relationships with both of his “dads.” And striking the comedy/tragedy balance. This is always a challenge. JF: This is a tough question, because I had a blast writing “Mastermind.” I gave birth to twin demolition experts who were raised by feral razorbacks and a pair of man-eating albino alligators named Laurel and Hardy. Then I set off a volcano while simultaneously annihilating Mount Rushmore. Need I say more? HT: The bringing together of an over the top, James-Bond type villain and the very real and devastating illness of Alzheimer’s in this story sheds an interesting new light on the disease and its effects. What made you decide to combine these two very different elements in the same story? JF: I’m an ironic monster, so the notion of a “Mastermind” being taken down by dementia – the notion of someone’s own brilliant mind betraying him – is right up my alley. And I tend to yoke together seemingly disparate elements, so “criminal organization” and “Alzheimer’s” actually merged quite nicely, within the context of my story. The Organization is a family, after all, and Carl is the Professor’s caregiver, a position that enables Carl to enact “leader,” only covertly. But the writing of this story was also prompted by real-world events – my mother’s Alzheimer’s diagnosis, and its aftermath. Once a dementia sufferer can no longer assimilate new information, it becomes impossible to resolve any of the things, relationship-wise, that remain unresolved. And this is one of the most devastating aspects of Alzheimer’s. The sense of helplessness that descends on the child/caregiver is profound, and in “Mastermind,” this is where Carl is living. HT: The concept of fatherhood plays strongly throughout this piece, from Carl’s “two dads” to Mt. Rushmore’s edifice of our founding fathers. Can you talk a bit about this theme and how it is woven throughout “Mastermind”? JF: I grew up in an all-female household, but I write about fathers and sons non-stop. I think the male tendency to reticence might be what I find so fascinating. Father/son relations, so vital and formative, are established, but often, and unlike mother/daughter relations, are never discussed. Sons need things from their fathers, and vice versa, but asking for those things can be difficult. Fathers, father-figures, sons, and son-figures do abound in “Mastermind,” and communication tends to elude them all: Carl and his father, Carl and the Professor, the Professor and his outlaw brood, Carl and Rags. And in the context of this story, that collective communication breakdown leads to inevitable disaster. HT: Though your title, “Mastermind,” at first seems to refer to the Professor, in the end it is really Carl who is the “Mastermind” of this story. Why did you decide to tell the story from his point of view? HT: Are you a fan of James Bond films? Or is there any other genre of movies that you feel has greatly influenced your work? JF: I’m a colossal movie nerd, and I enjoy the Bond films, but other genres are far much more important to me. Westerns are huge, as are noir films. Hitchcock! I love the ways in which artifice exposes humanness, and vice versa. I tend to collapse “fantasy” into “reality” in imitation of Michael Powell, masterful maker of The Red Shoes, Black Narcissus, A Matter of Life and Death. I think of Carol Reed, of the interesting danger into which he plunges his characters, of their profound banter. The Fallen Idol, to my mind, is absolutely essential viewing. The Night of the Hunter, Charles Laughton’s only film, is immensely important to me. For smolder, I look to Elia Kazan. For humor, Mel Brooks. For landscape, Akira Kurosawa and John Ford. And I haven’t yet mentioned Welles. Or Kubrick. Or Lang. Or Carpenter. Or Bergman. But I’ll stop there. JF: Two weeks. For publication in One Story, and with the assistance of Hannah Tinti, I revised “Mastermind,” a process that took another week or so. JF: I “finished” my first novel last summer, but I’m still tinkering with that. Like “Mastermind,” it was inspired by my experience with Alzheimer’s. The novel is narrated, collectively, by the dementia patients in an assisted living facility, who act as a Greek Chorus. And I’ve started work on a new novel, a coming-of-age tale about mean girls, romance novels, and exotic animals. JF: Obsession = compelling fiction. One of my first workshop leaders pointed this out, and although he was talking about characters, I’ve found that it also applies to writers.